Becoming familiar with the ins and outs of BrightGauge can take some time and practice. Hopefully, you’ll find some guidance in our knowledge base and through our blog posts, but we know that seeing BrightGauge in action can make a huge difference. 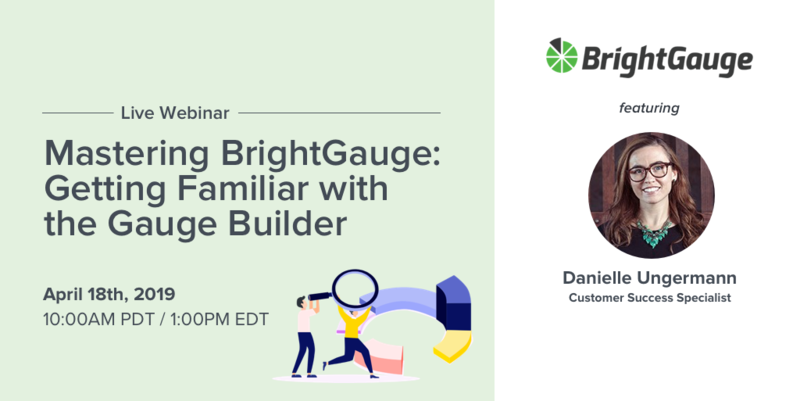 In our new webinar series, Mastering BrightGauge, we’ll help you really nail down your use of BrightGauge while improving your workflow. This series is meant to give you a deeper training of our BrightGauge features, whether you’re a new user or could stand to use a little refresher. To kick off the Mastering BrightGauge series, we’re going to talk all about building gauges. Lots of our users want to know how they can better customize their KPIs in order to achieve stronger data insights, and this is an excellent place to start. You’ll walk away feeling a lot more comfortable customizing your own gauges and getting to the data that speaks to you. We highly suggest you RSVP because even if you end up missing the live webinar, we’ll still email you a recording of the training, which you can keep on hand to reference any time you need it. To find out about future episodes in the Mastering BrightGauge series, keep an eye out for emails from us, follow @BrightGauge on Twitter and Facebook, and subscribe to our blog. As always, we love your feedback and your questions, so shoot our support team an email if there’s anything you need.